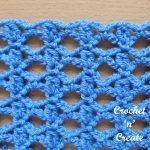 Free Crochet Tutorial Lattice-Bar Stitch – Learn how to crochet this beautiful stitch, it is ideal for light weight scarves, shawls and bed runners, you could also use for a decorative table runner. 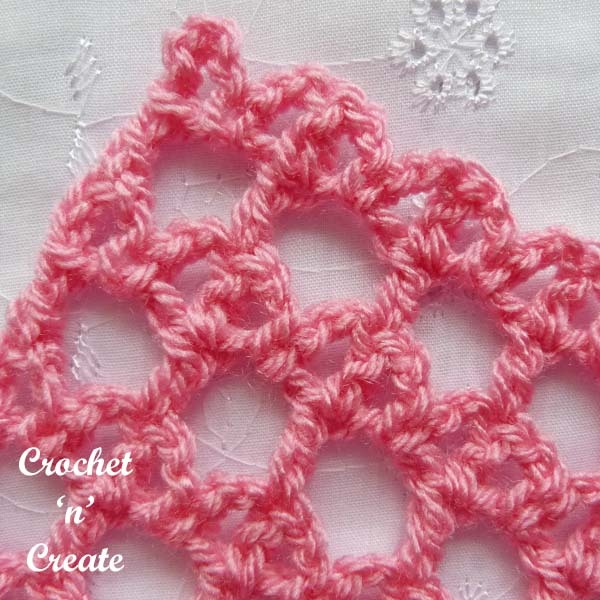 Made up of just 2 rows of pattern, you will pick it up in no time at all, see my step by step instructions below. 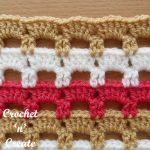 crochet tutorial lattice-bar stitch, scroll down the page to the PRINT icon at the bottom of the post. ch5 counts as first dc and ch2. ch6 counts as first dc and ch3. 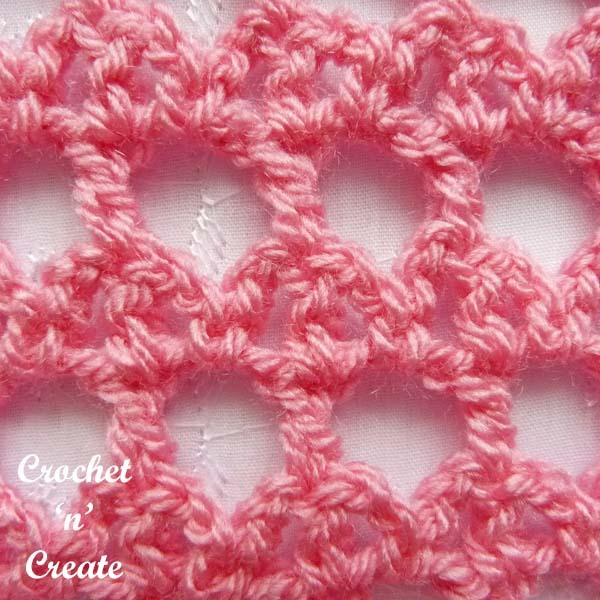 First Row – 1dc in 10th ch from hook, * ch3, skip 3ch, 1dc in next ch, * rpt from * to * to end. Turn. Second Row – ch5, * skip 1ch, 1sc in next ch, ch2, skip 1ch, 1dc in next dc, ch2, * rpt from * to * to last 9ch, skip 1ch, 1sc in next ch, ch2, skip 1ch, 1dc in next ch. Turn. 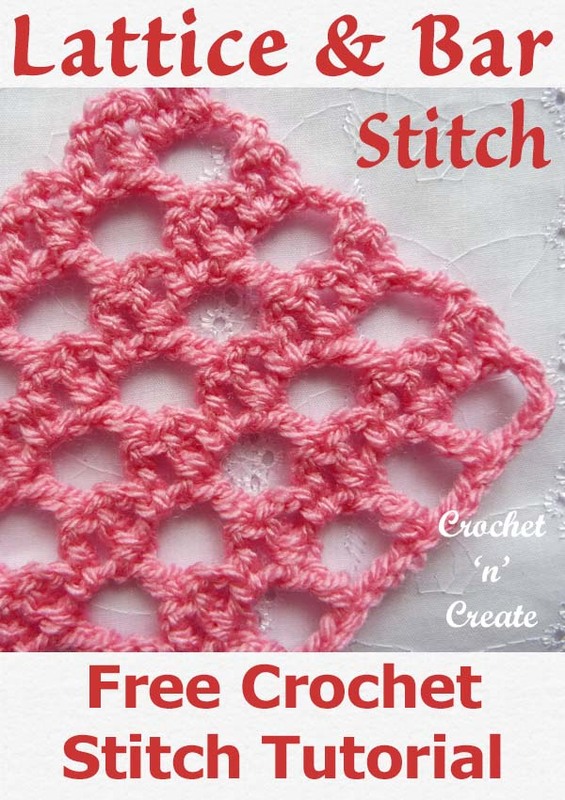 Third Row – ch6, * skip (ch2, sc, ch2), 1dc in next dc, ch3, * rpt from * to * to last ch5, work 1dc in 3rd of ch5. Turn. Fourth Row – ch5, * skip 1ch, 1sc in next ch, ch2, skip 1ch, 1dc in next dc, ch2, * rpt from * to * to last 6ch, skip 1ch, 1sc in next ch, ch2, skip 1ch, 1dc in next ch. Turn. 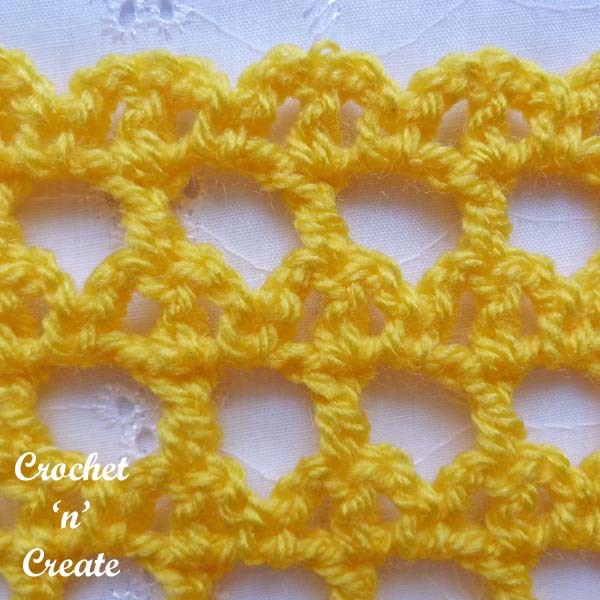 Rpt Third and Fourth Rows to desired length. 5ch counts as first tr and 2ch. 6ch counts as first tr and 3ch. 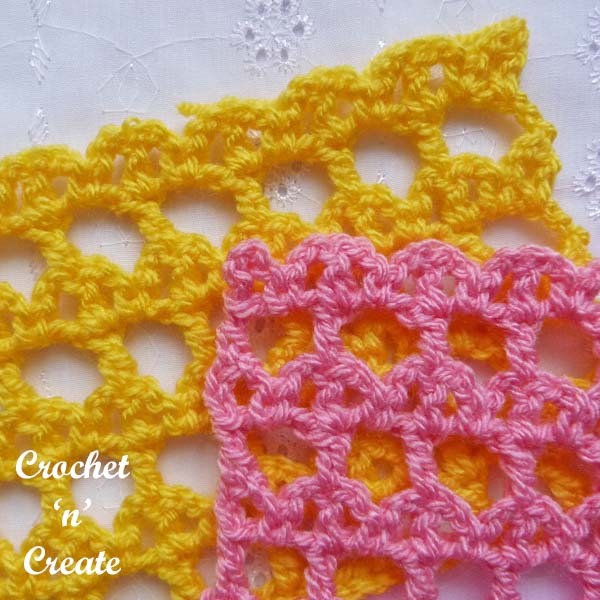 First Row – 1tr into 10th ch from hook, * make 3ch, miss 3ch, 1tr into next ch, * rpt from * to * to end. Turn. Second Row – 5ch, * miss 1ch, 1dc into next ch, make 2ch, miss 1ch, 1tr into next tr, make 2ch, * rpt from * to * to last 9ch, miss 1ch, 1dc into next ch, make 2ch, miss 1ch, 1tr into next ch. Turn. Third Row – 6ch, * miss (2ch, dc, 2ch), 1tr into next tr, make 3ch, * rpt from * to * to last 5ch, work 1tr into 3rd of 5ch. Turn. Fourth Row – 5ch, * miss 1ch, 1dc into next ch, make 2ch, miss 1ch, 1tr into next tr, make 2ch, * rpt from * to * to last 6ch, miss 1ch, 1dc into next ch, make 2ch, miss 1ch, 1tr into next ch. 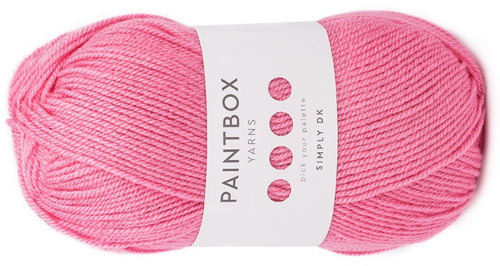 Turn. 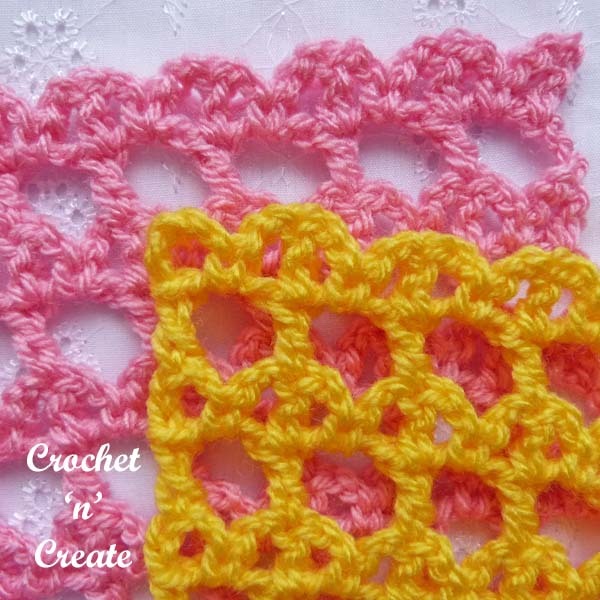 The written instructions and the pictures for the free crochet tutorial lattice-bar stitch are copyrighted to crochet ‘n’ create © 2019. 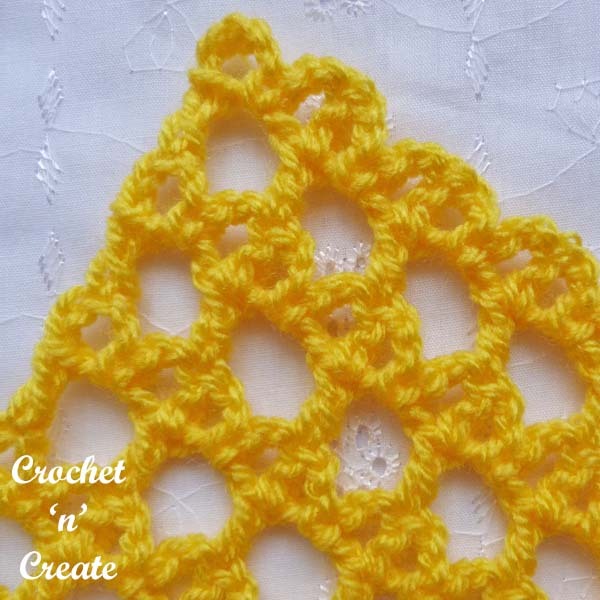 If you wish to tell your friends and followers about the free crochet tutorial lattice-bar stitch, please can you only use the direct link to the page on crochet ‘n’ create. 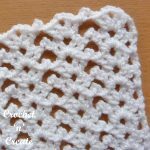 This entry was posted in Crochet Stitches, crochet tutorial and tagged crochet, crochet stitches, crochet tutorial, How too on 17th January 2019 by crochetncreate.